About - New Process Fibre Company, Inc.
Back in 1927, F. Carl Porter founded New Process Fibre (NPF) with a desire to improve manufacturing processes; Porter coined the company name after the innovative process he developed for a new, lower-cost means of turning cotton paper into vulcanized fibre. Under the guidance of Porter’s son-in-law Henry Peters, NPF broadened its focus to improving every part of the the non-metallic stamping process, including vulcanized fiber washers. Over the years, NPF has continued to grow and innovate — improving processes and providing essential non-metallic stamping solutions across a range of industries. Our family-run business is now in its third generation, and though our products and processes have changed since 1927, our family’s desire to constantly improve operations has never wavered. Today, we continue the tradition of improving products, maximizing quality, and maintaining cost-effectiveness with our dedication to in-house manufacturing capabilities. We pride ourselves on keeping all operations in-house to ensure every step of the non-metallic stamping process is performed to the highest standard and we are consistently delivering the highest-quality products to our customers. With all of these features available within our own facility, we can fill any order without the need for outsourcing. Vulcanized Fibre: A laminated plastic comprised of natural cellulose, vulcanized fibre is a tough, resilient material that is lighter than aluminum, tougher than leather, and stiffer than most thermoplastics. 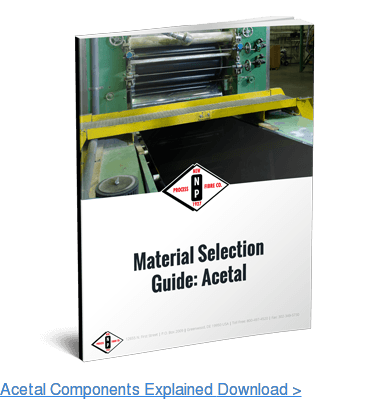 Acetal: A synthetic sheeting material, acetal copolymer exhibits high strength and resistance to impact and fatigue, making it a common weight-saving replacement for metal. Nylon: Nylons are tough thermoplastics with a high capacity to withstand impact, wrinkling, tension, and bending in a wide range of temperatures –– from freezing to 300° F. In addition, nylons have low-friction properties, high electrical resistivity, and a strong resistance to alkalis and acids. Nylon MDS: Nylons filled with MDS (molybdenum disulfide) are highly resistant to wear and exhibit physical properties about 20% greater than those of unfilled nylons. High-Density Polyethylene (HDPE): HDPE is a corrosion-resistant material that has high-impact strength and can withstand extreme temperatures. The material also has high tensile strength and can resist abrasion and stress-cracking. With so many desirable qualities, HDPE is a popular material used in industries, such as food processing, chemical and petroleum manufacturing, and pharmaceutical processing. Low-Density Polyethylene (LDPE): LDPE is a corrosion-resistant material made of highly branched polyethylene shaped through a die at very high pressures. LDPE has a soft surface, low moisture permeability, and good tensile strength, as well as useful electric properties. Often utilized in films and packaging materials, LDPE is commonly employed in the food processing, paper, chemical, petroleum, pharmaceutical, marine, and tanning industries. Other Special Stamping Materials: NPF offers a wide variety of other special non-metallic stamping materials, such as Buckfab, Duroid®, Garlock®, Kraftpaper, and many more. If we don’t carry a certain material that you’re looking for, we are happy to work with you to bring in a special supply of it or find an acceptable replacement material. 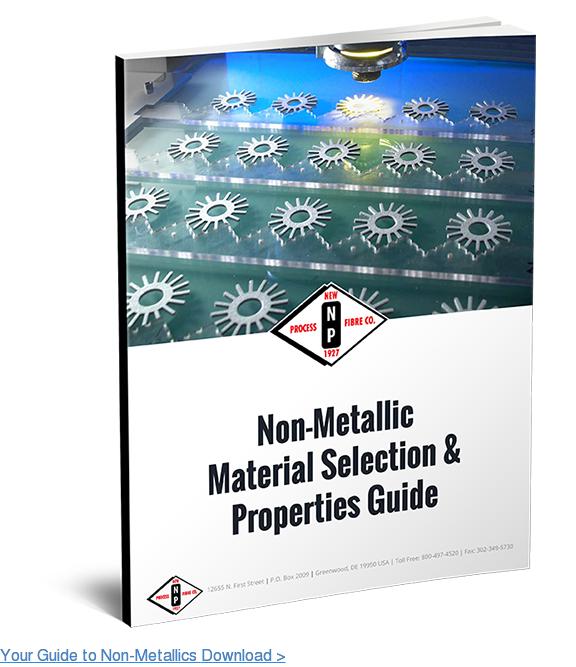 Check out our Special Stamping Materials page to see our offerings. In addition to our state-of-the-art tooling, we produce a number of extruded materials in-house, such as high-density and low-density polyethylenes, polypropylene copolymers and homepolymers, acetal copolymers, nylons, and nylon MDS. By manufacturing these materials in-house, we have more control over the materials used in stamping, adding value and quality for our customers. Our family business has always been committed to improving products, maximizing quality, and maintaining cost-effectiveness. With our wide selection of materials, state-of-the-art tooling and in-house capabilities, and strong quality assurance program, we are dedicated to providing customers with the highest-quality stamped non-metallic components. 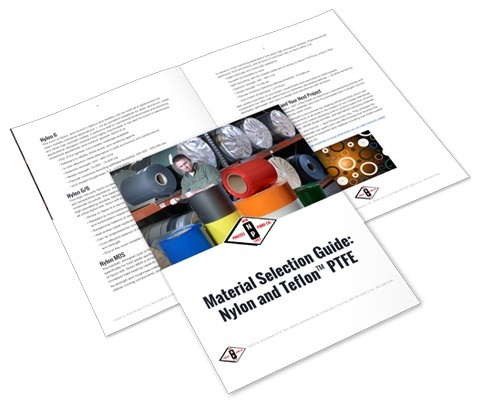 To learn more about which material best fits your upcoming project, download our Material Selection Guide. To discuss potential solutions to your non-metallic stamping needs, contact us to speak with a member of our team.